Some people say that falling rents mean the wheels have come off the property market. They’ve got their thinking backwards. Would you be scared if I told you rents are falling? That’s what the data are showing us, with median rents falling about 1% in the September quarter – looking at the combined capitals median. Sydney was the only city to post any rental gains worth noting, while rents were falling particularly quickly in Perth and Darwin. But still, with the yield on houses around 3.4% and the yield on units around 4.2%, there’s not a lot to get a girl excited. Of course, the combined capitals data hides what’s going on in the cities, but digging down further, the news doesn’t get any better. In Sydney and Melbourne – our big gun markets – yields are just 3.1% and 2.9%. 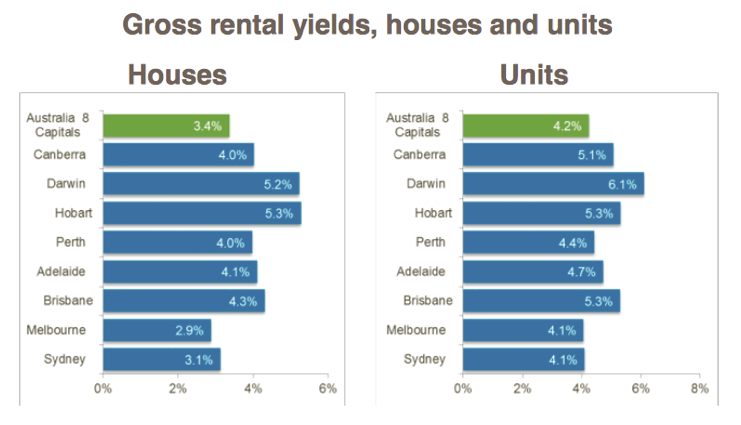 Yields are improving and telling a brighter story in Perth, Hobart and Darwin, but mostly because prices are consolidating fast enough to make stagnant rents look good. Of course these are median statistics. If you’re buying the median house and you’re willing to settle for median rents, you probably deserve sub-3% returns. At this stage in the cycle, it becomes clear who has put time into developing solid manufactured growth strategies, and who is rudder-less in the water, just hoping to go with the flow. But what’s the longer-term outlook here? Is property becoming a no-go investment? I think it’s useful to remember that falling yields are being driven by two factors. First, there is the cyclical. Go back to the first chart and you’ll see that yields have their ups and downs. We’ve just tucked 3 years of solid price growth under the belt, and accelerated price gains will naturally put downward pressure on yields. However the more interesting story is the “non-cyclical” or what they call, “secular” factors. And at this point you’ve got to remember that the property market doesn’t exist in a vacuum. If we’re looking at the yields of property as an investment class, then we don’t want to compare it to yields on property ten years ago. We want to compare it to other assets. And on that measure, property is still doing fine. Because across the world and across every asset class, yields are falling. And that’s been driven by falling interest rates. In Australia we have the lowest official interest rates on record. We’re not the only country that can say that. And the interest rates of everything in the economy – mortgages, bank deposits and even pork-belly swaps – everything keys off the official rate one way or another. And so when interest rates are low, the returns on every investment fall. If you want to convince someone to lend you money rather than stick it in the bank, you’ll offer to pay an interest rate that is equal to the bank rate, plus a premium to compensate them for the risk they take on. But if the official rate is falling, then the rate you need to pay for your loan also falls. The rate an investment needs to pay to attract investors, falls. And this, more than anything, explains the trend decline in yields. It’s an interest rate story. Not a property market story. If we take our yield chart back to 1997, we can see that yields have been on a steady long-run decline since the late 90s. The cycles in the property market almost had no impact on yields at all. And so the people who say the property market is about to ‘crash’ (oh, if I had a dollar for every time…) because rents are falling kind of have the causation backwards. 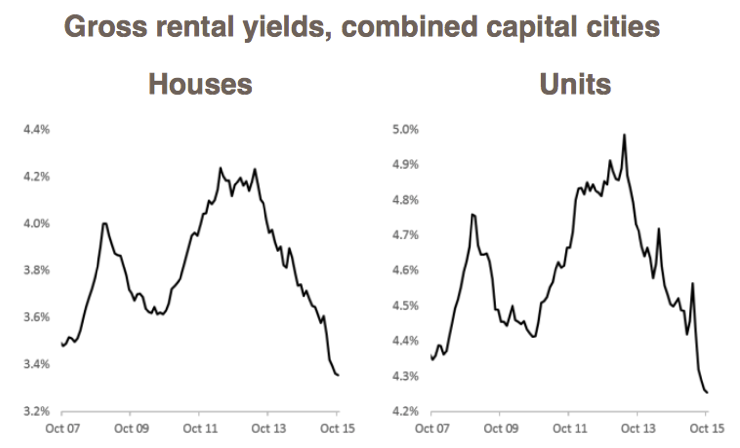 It’s not that rents are falling and therefore yields are falling. It’s more that yields are falling across the board, therefore rents in particular are falling… to bring property yields into line with yields in other investment classes. I just wanted to clear this up because I hear a lot of people say that falling rents mean the wheels are coming off the property wagon. It’s just not true. It’s a different world, and yields are lower in every asset class. However, while that’s all well and good, it’s hard to generate amazing cashflow on yields of 3%. That’s one of the reasons I’ve been diversifying my position a bit. Looking abroad to places like the US where you can readily find double digit yields. I still like my cashflow. But in the new investment landscape, we perhaps need to be a bit more deliberate about choosing growth plays and cashflow plays. That’s not rocket science. Just something to watch. Are people finding it tougher to get the rents and yields they were after?